Enterprise HDDs: Also known as a disk drive. Enterprise HDDs are disk drives with higher performance, capacity and reliability than HDDs for PCs. 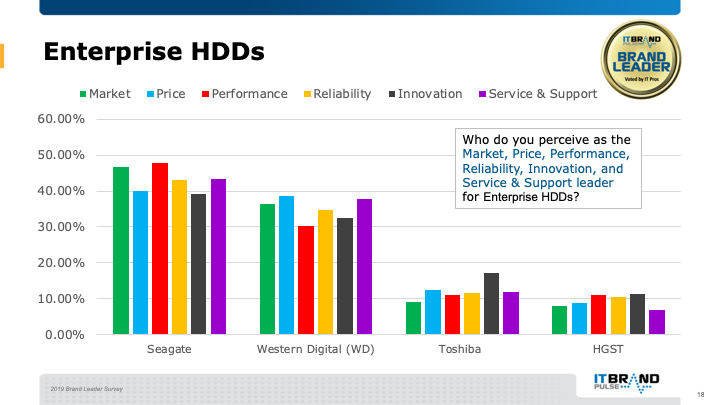 While the top two companies of Enterprise HDDs were close in all categories, Seagate has proven itself a leader by being voted Market for the seventh year in a row; also picking up titles for Price, Performance, Reliability, Innovation, and Service and Support, sweeping the board for a two-year streak. Western Digital came in second for all categories trailed by Toshiba.